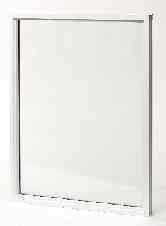 The Columbia Series 2200 thermal break primary aluminum window is designed for single dwelling through multi-family units. This window is manufactured in standard sizes for new construction, or custom sizes for retro fit applications. The Columbia Series 2200 aluminum window is a high quality affordable choice for new construction or replacement windows. General: The series 2200 picture aluminum window units are F-C35. The windows shall comply and bear the quality certification label in accordance with the ANSI/AAMA certification program 101-93. Material: The Columbia Series 2200 aluminum window frames and sash members shall be aluminum alloy 6063-T5 within commercial tolerances. Frame and sash members shall have a thermal barrier. The internal fins will have suitable break off and nailing grooves. Finish: Standard finish shall be of electostatically applied baked enamel. White and bronze are standard finishes. Construction: Standard finish shall be of electostatically applied baked enamel. White and bronze are standard finishes. .